From the New York Times bestselling author of the Quinn Colson series comes a fast, funny, violent noir novel based on the crimes of George “Machine Gun” Kelly. Set in the first days of the modern FBI, Infamous is a passionate blend of historical novel and crime story featuring an unexpected hero, some of the most colorful supporting characters in recent crime fiction, and unforgettable femme fatale Kathryn Kelly—the Lady Macbeth of Depression-era crime. 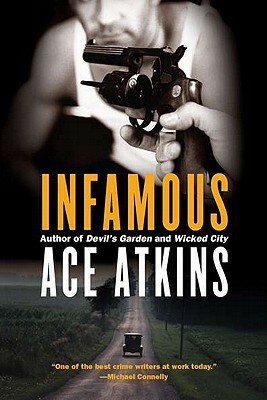 Ace Atkins is the New York Times bestselling author of the Quinn Colson novels, the first two of which—The Ranger and The Lost Ones—were nominated for the Edgar Award for Best Novel (he also has a third Edgar nomination for his short story, “Last Fair Deal Gone Down”). In addition, he is the author of several New York Times bestselling novels in the continuation of Robert B. Parker’s Spenser series. Before turning to fiction, he was a correspondent for the St. Petersburg Times, a crime reporter for the Tampa Tribune, and, in college, played defensive end for the undefeated Auburn University football team (for which he was featured on the cover of Sports Illustrated). He lives in Oxford, Mississippi.